She's blew into town and left a frozen world in her wake. I hoped the snow that was forecast would arrive and protect the garden from subzero temperatures that threatened. We got ice instead. It looked like snow, but, it was ice. A dangerous ice that brought the city to a halt, closed schools and downed power lines. It sparkled and beckoned me to explore, so I bundled up, grabbed my camera and ventured out. Trees, shrubs, grasses and power lines. I was shocked to find perfect Hamamelis vernalis/Ozark witch-hazel blooms under the ice. They appeared to be waiting until the sun would release them from their winter prison! At the risk of sounding melodramatic, I could relate to feeling like a prisoner trapped in winter ice! But, what a delight to see those witch-hazel blooms on my Mom's memory tree! The promise of warmer days in those ice covered blooms was enough to melt my resentment towards this mean winter weather! Yes, I will lose plants, but, others will endure, that's what life is like in a garden. Soon the ice will melt and the witch-hazel flowers will unfurl their spidery petals and send their spicy sweet scent wafting through the garden. That's enough for right now! I hope you don't end up with an overwhelming amount of broken branches. 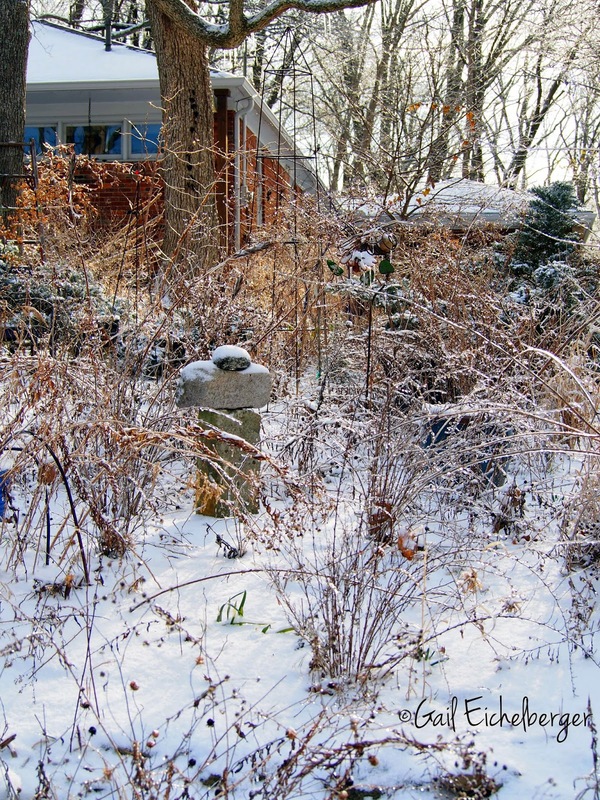 We had an ice storm a couple of years ago, and the garden was a mess after it melted. A lot of stuff drops after it unfreezes. Thanks for sharing your photos, the ice is beautiful but so scary and dangerous. I noticed several had fallen in the way back backyard and I am hoping that none fall in the front garden or on the roof! Ice is so very beautiful and so impossible to walk/drive on. At lease this prison has a short sentence. Yikes! It looks pretty though! Great pictures, tough conditions. I hope you get a melt soon! These are amazing photos. Stay warm and safe. Looks like y'all got a little more snow than we did. Crazy times! 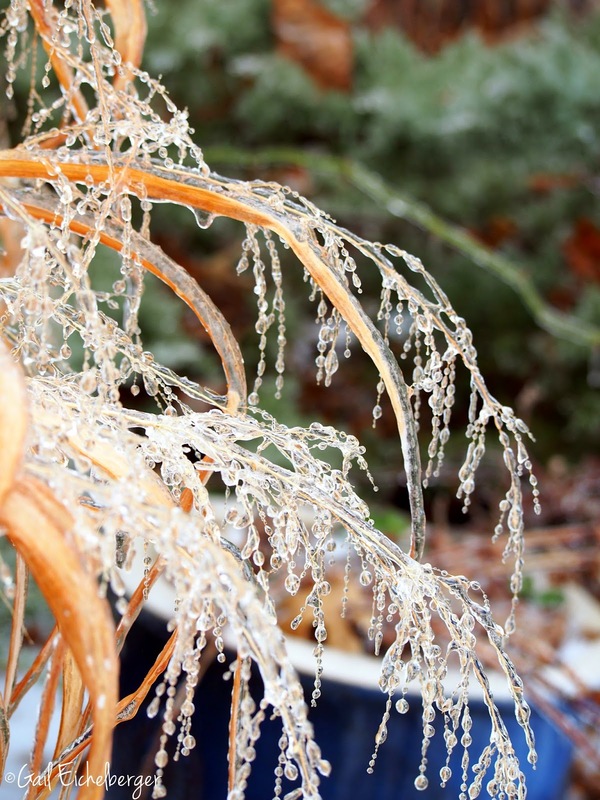 I love the shot of the switch grass looks like ice jewels dangling on it. Hope you stay warm and safe in the next blast on its way tomorrow. I love your attitude towards it all. Stay warm! It all looks so stunningly beautiful, as you say, yet dangerous, too! I've been thinking of all you folks in the Southeast and East Coast with cold and snow and, in your case, ice. Your photos are beautiful, as always, Gail. Witch hazel blooms look like party ribbons. Maybe they know something we don't. Ice is a beautiful but harsh editor of our gardens. Always a rough raft. Never a final copy, she said. I'm glad you ventured out to capture the ice-covered world as you have some lovely photos! I hope it melts soon though and that there isn't too much damage - we had a lot of branches coming down in our region with the weight of wet snow and ice over several days. I feel so lucky to have a blanket of snow on the garden to protect it from all of these negative temps we have been having. Let us take heart in knowing Spring will come. Those are stunningly beautiful pictures. You have sparkling ice, we have a white wonderland of snow. Spring will be sweet this year. I will be watching for yours. Mine will surely come along later. wish you and your garden well as you anticipate spring! Dangerous but pretty at the same time. Hello Gail girl ! .. wow .. you have a small taste of Canadian weather there .. I love your witch hazel .. but, I am hoping the blooms are tough enough to stay put .. ice has a way of making them drop from the shock. We are locked in a lot of snow and COLD temps here .. no hope of Spring far past the supposed date .. BIG sigh! Ice can be beautiful as your images show, but also damaging. I hope your weather returns to normal soon so you can continue moving on to spring. Ice storms are incredibly beautiful when the sun shines on them......and so treacherous at the same time! Here in MA we are covered in 5+ feet of snow and frigid temps.....yearning for Spring! Happy gardening! Oh I much prefer the snow although not as much as we have had....lovely ice sculptures. Yes, the garden in ice is heart breaking, but beautiful. It is hard having this time of year be colder than normal. I am so ready for spring, but winter is not letting go yet.